Indutrial camera fixed focus lens with focal length 8.0mm and aperture F/1.4 is high cost-performance, to help users obtain realistic and clear images. It is ideal choice for various industrial detection, intelligent transportation and machine vision. There are three international standards for industrial camera lenses: F mount, C mount and CS mount. F mount is a general-purpose interface, generally applicable to the lens with a focal length of more than 25mm. When the focal length of the lens is less than 25mm, the size of the lens is not large, and a C-mount or CS-mount is generally used. The difference between the C and CS mount is the distance from the indutrial lens and the camera contact surface (datum plane) to the camera focal plane (position of the industrial camera CCD photoelectric sensor), that is, the flange distance is different. And the flange distance of the C mount is 17.5mm. The CS interface flange is 12.5mm. 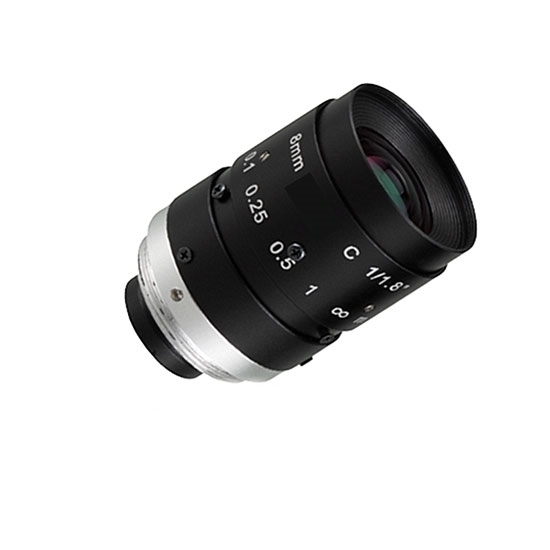 A 5mm C/CS adapter ring can be used in conjunction with the C-mount industrial lens and the CS-mount indutrial camera. The CS–mount lens cannot be used with the C-mount camera.